While other industry leaders are showing off their new ventures and inventions, SanDisk joined the party by unveiling its new G3 series solid-state hard drives (SSD) designed particularly as drop-in replacements for conventional hard disk drives in netbooks and notebooks. The famous flash memory card maker promised that this so called world’s fastest multi-level cell SSDs are more reliable and more resilient besides running 5 times faster that the industry’s current HDD and double the speed of SSDs unveiled in 2008. SanDisk’s new G3 series SSDs come in three different sizes: 60GB, 120GB and 240GB. The prices for each respective size are as follows: 60GB for $149, 120GB for $249 and 240GB for $499. This price range is on the high side compared to existing HDDs. However, these new technology drives are gaining popularity and increasingly being used as a storage device in laptops and other electronic devices due to their speed and reliability. Since there are no moving parts in them, the drives themselves are more rugged and consume less power. 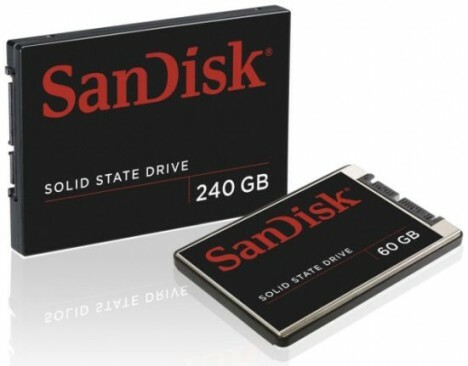 “We think that this is a major inflection point,” said SanDisk chairman and CEO Eli Harari. “To date, solid state drives (SSDs) have been largely confined to low-capacity netbooks. But SanDisk’s G3 SSDs have enough capacity to be used in full-fledged notebooks as well — 60GB ($149), 120GB ($249) or 240GB ($499). At those prices, many of us will switch to solid state notebooks that boot in seconds”.